Larry Watson Painted a great number of 1957 Chevies in his career, some mild with only added scallops, and some very wild with full pearl and Candy paint jobs. 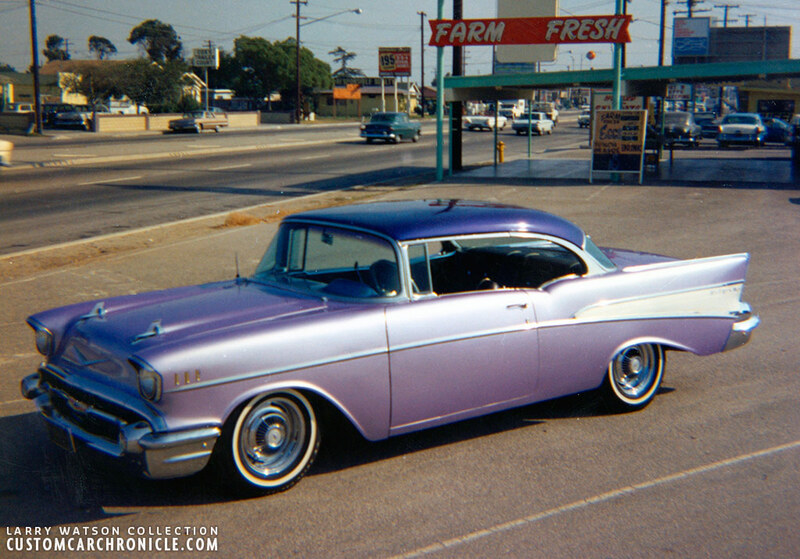 The 1957 Chevy is the one of the always popular Tri-Five Chevies 1955-1956 and 1957 that gets the least customized, at least in the past few decades. 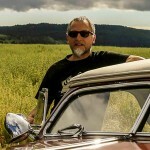 The car has always been very popular among restoration people, as well as with the street machine crowd. But for some reason it was never used a lot as Custom Car. That said… I was quite surprised to find sucha great number of Larry Watson paineted ’57 Chevies in the Larry Watson Personal Photo Archive. 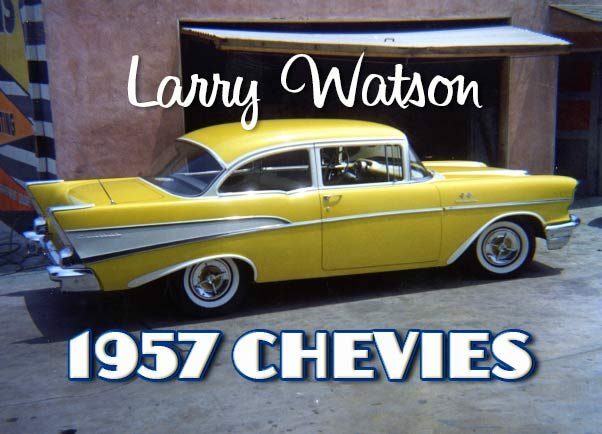 I have to say that most of the Larry Watson painted ’57 Chevies are only mildly restyled, most only with suspension and tire-hubcaps dress up customizing. But it does show that the ’57 Chevies were used as base. The first samples of Larry adding scallops to stock bodied ’57 Chevies come from Larry’s very first shop at 1016 E Artesia in North Long Beach. Larry had this shop from 1957 to 1958. Making the ’57 Chevies at this shop brand new, or nearly new cars. Completely stock bodies Hard-Top with lowered suspension, lakes pipes, Four bar hubcaps, ’54 Chevy grille and a set of Larry Watson scallops. Notice the real Appleton Spotlights. 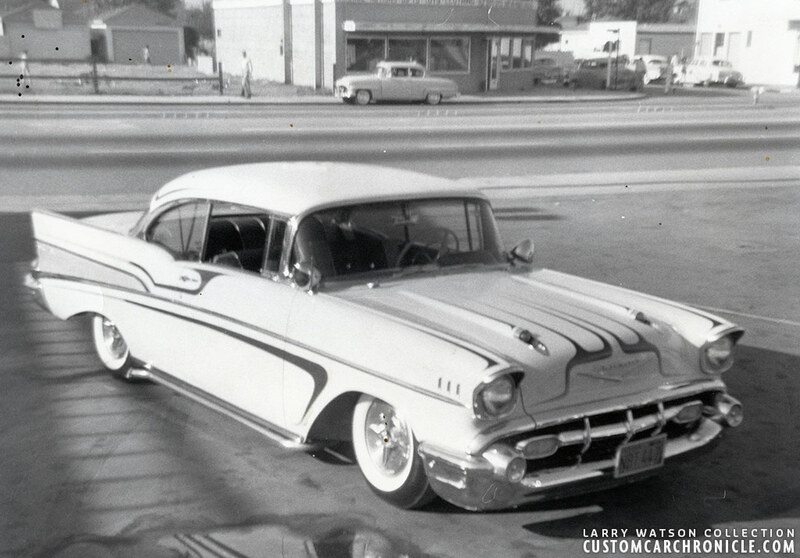 Photo taken in front of Larry’s1016 E Artesia in North Long Beach Shop. Another earl black and white photo shows a hard top with scallops with bold white outlines. The body and even the suspension seam to remain mostly stock. Except for the aftermarket bumper over-riders. Another scallop paint job by Larry Watson on a stock bodies Hard-Top. The scallops are fading front to rear and have a white pinstriped outline. The interesting part about these scallops is that they are a mix of flames and scallops. A further development from those above. Only real modification seams to be the addition 1957 Plymouth hubcaps, and a slight stance adjustment. Rear view of the same ’57 Chevy Hard-Top as above. 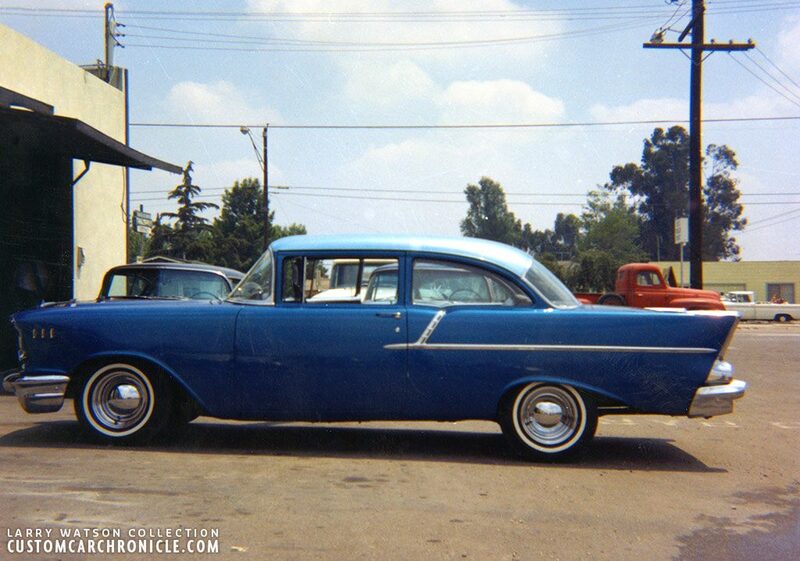 This ’57 Chevy 2-door sedan is interesting since Larry had a few different photos of the car in his collection. 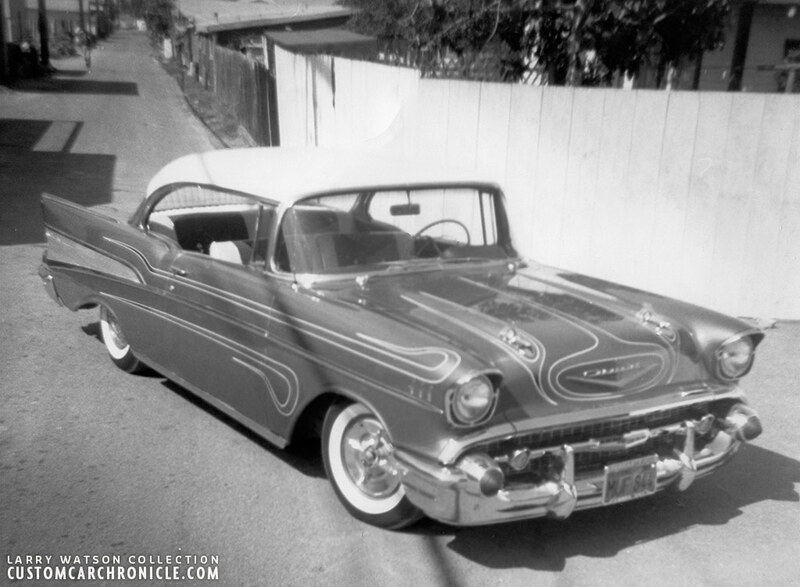 These black and white photos show the car painted all black in front of Larry’s 1016 E Artesia in North Long Beach Shop. Beautiful mild custom with the right stance, white wall tires, three bar hubcaps and lakes pipes. Larry also had a few photos of the same car, but now with nice pale yellow to red scallops in his Collection. The unidentified member had a Renegades Long Beach club plaque in the rear window. 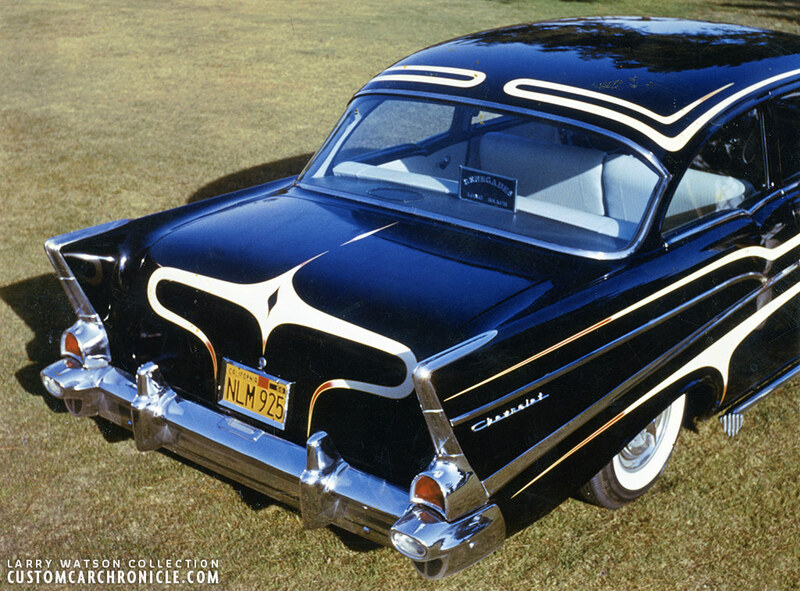 Another black ’57 Hard top that Larry did shows early style scallops in gold with fading red details, outlined in white on this mildly restyled, nosed and emblems removed ’57 Chevy. 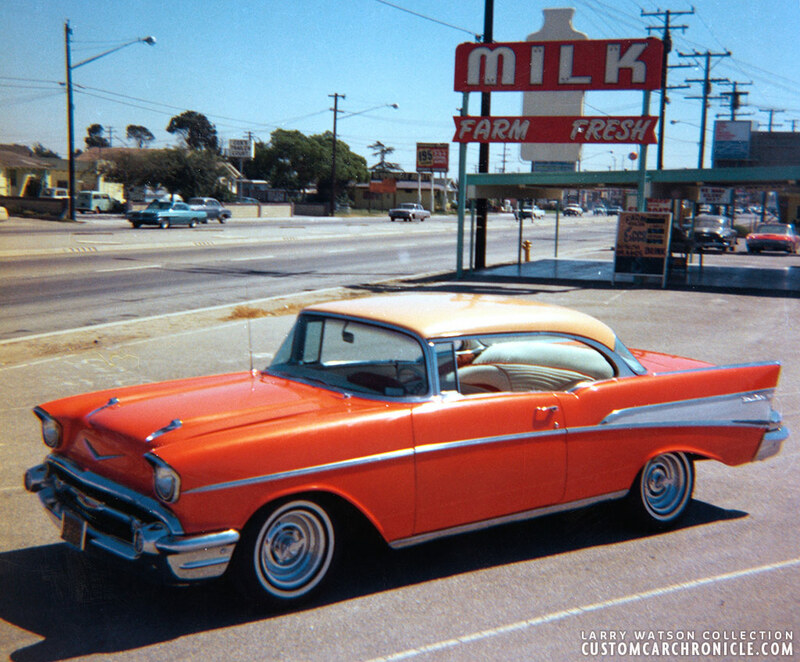 The photo was taken at Larry’s 1016 E Artesia, North Long Beach shop. 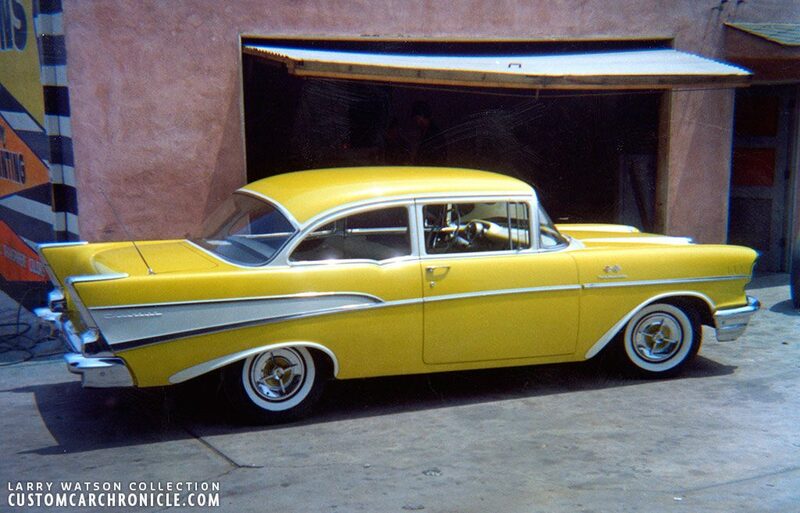 One of my personal favorite scallops paint job by Larry Watson is done on this unidentified pale yellow ’57 Chevy hard-top. The scallop Larry added to the side of the car looks so perfect on the car and enhances the shaped of the body and trim. The 4-bar lancers and perfect size white wall tires sure help as well. Larry adding the silver for the scallops on the unidentified Chevy. 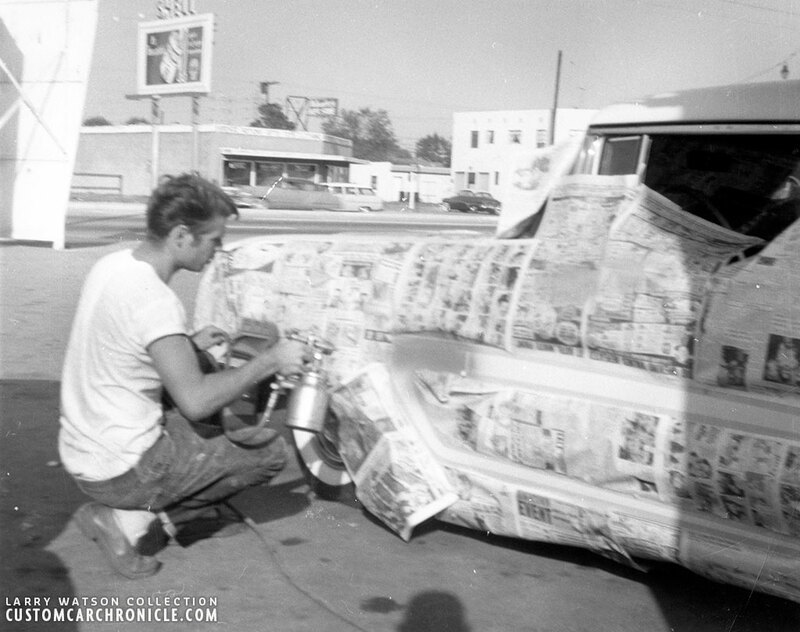 Masking tape and partly masked with newspapers painting outside in the driveway of his first shop. Same car as the photo above shows that it was updated a little later. First version had the single scallop on the sides, which was later duplicated with a second one above it, and a second scallop hides the body work needed for the emblem removal of the nose. 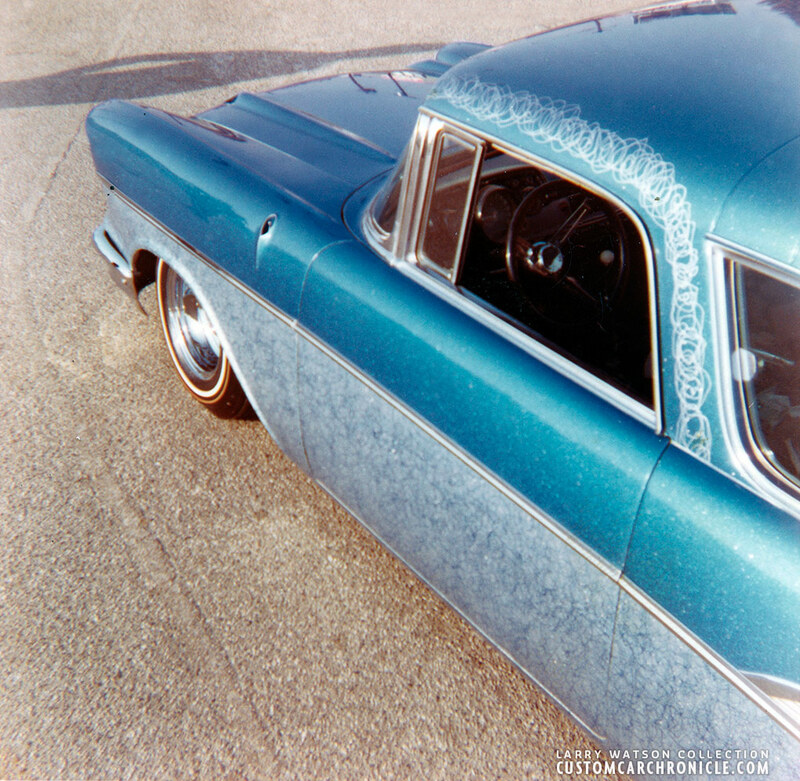 Candy blue scallops, most likely over a silver base on this stock bodies, lowered Hard-Top. This photo was taken in front of Larry’s9012 Rosecrans blvd. Bellflower Shop. 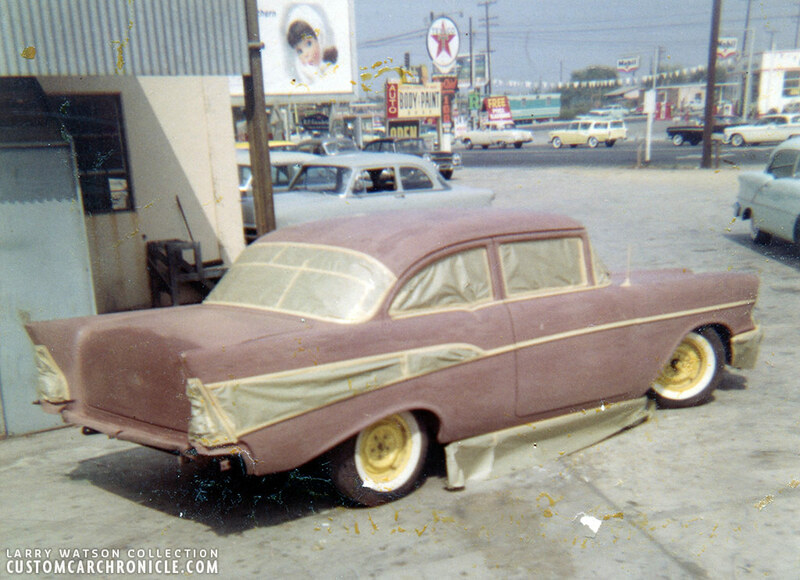 Interesting photo of an in progress ’57 Chevy at Larry’s Rosecrans Shop shows that at this time Larry did not even remove most of the trim, just taped off. Larry had upgraded to using actual masking paper by now. Larry adding some red accents to silver scallops on an unidentified ’57 Chevy. Late afternoon photo of this unidentified 1957 Chevy at the Larry Watson Rosecrans Blvd shop in 1959. 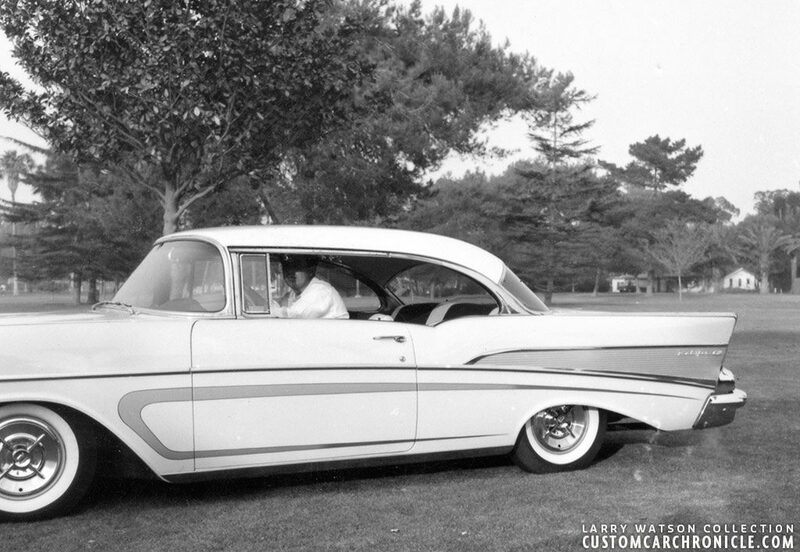 Larry painted this mildly customized 1957 Chevy Sedan in pearl white and added panels to outline the character lines of the Chevy. He painted the panels in pearl light blue and fogged them in with candy blue. 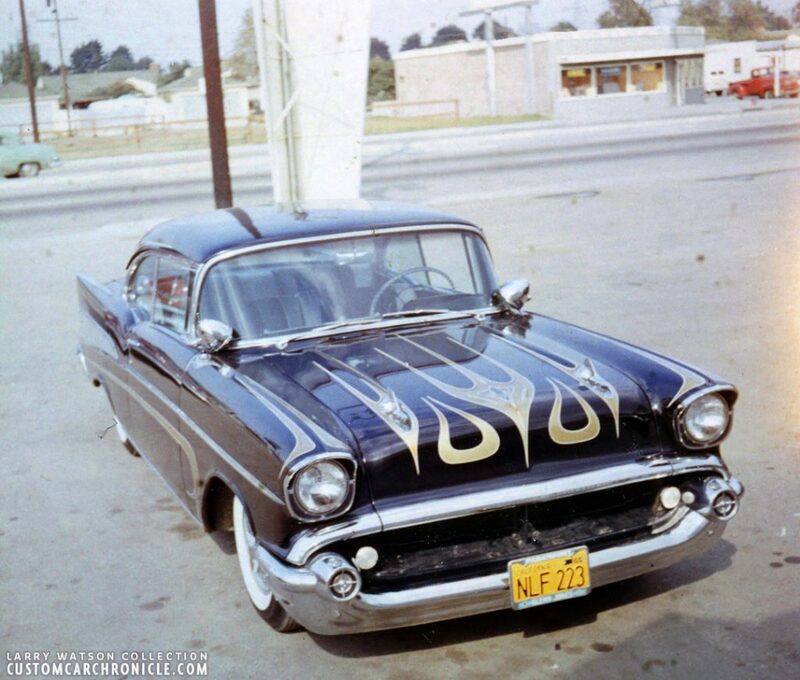 One of Larry’s wildest paint jobs on a ’57 Chevy. 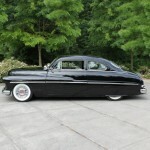 The car had wide white walls with Custom three bar spinners and full lakes pipes, dummy spotlights and lowered stance. Dallas Eichstadt’s 1957 Chevy 2 door sedan has not been modified much. Just some suspension mods to give it that Californian stance, combined with the right size white walls and Dodge Lancer four bar hubcaps. Both a perfect choice for this type of mild custom. Then Larry added his magic with a pearl white paint-job, followed by some carefully taping of the subtle outlines of the top, and teardrop/scallop elements around the wheel openings. Then he painted several coats of candy yellow creating a super bright yellow. The last step for Larry was outline the white with a very thin black pin stripe. 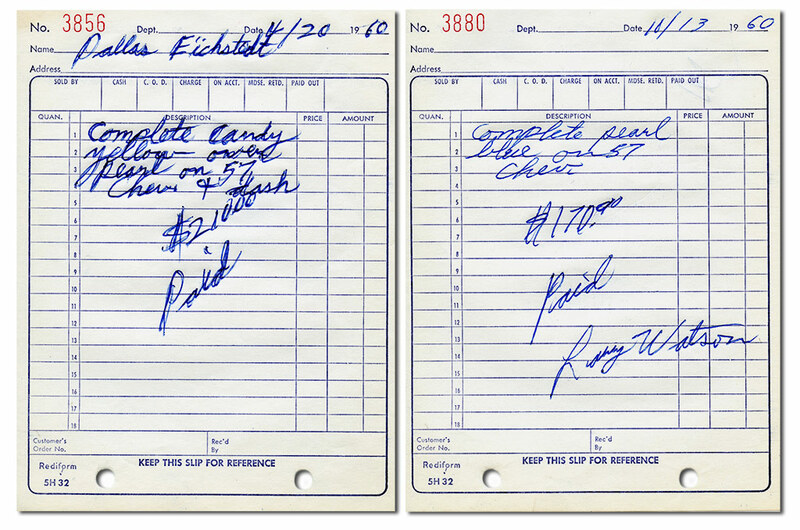 Two invoices that Larry kept shows us that Dallas Eichstadt had to pay $210 1960 USD for the Candy Yellow and white pearl as can be seen in the photo above. Sadly we do not have a picture of the Pearl Blue Chevy from the invoice on the right. Another nice two door sedan was left mostly stock and all the customizing was done with the stance/wheels/tires and the paint job. Some of the body badges where removed and then Larry added a wonderful combination of pearl ice green on the main body and candy dark green on the top. 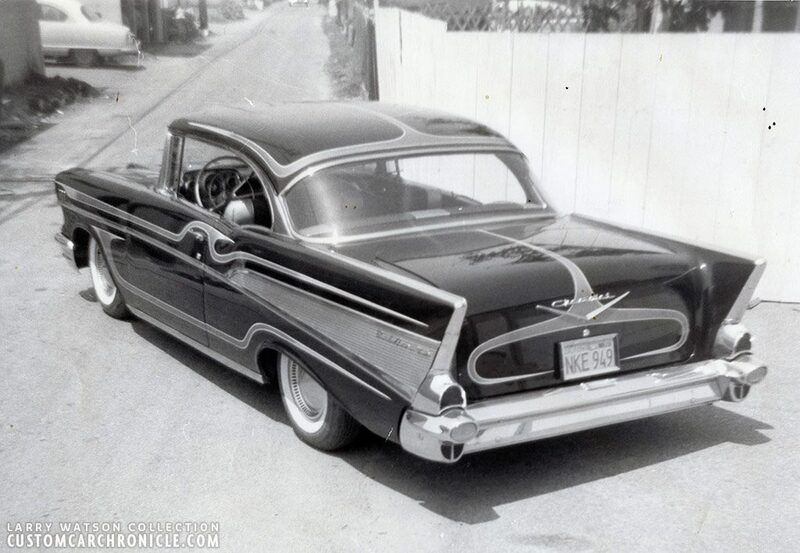 The car was set on a forward rake with small size white wall tires on chrome reserve wheels. Another 2-door sedan with beautiful Candy green body with silver flake roof and rear panel photographed in front of Larry’s Lakewood Blvd., Paramount shop. 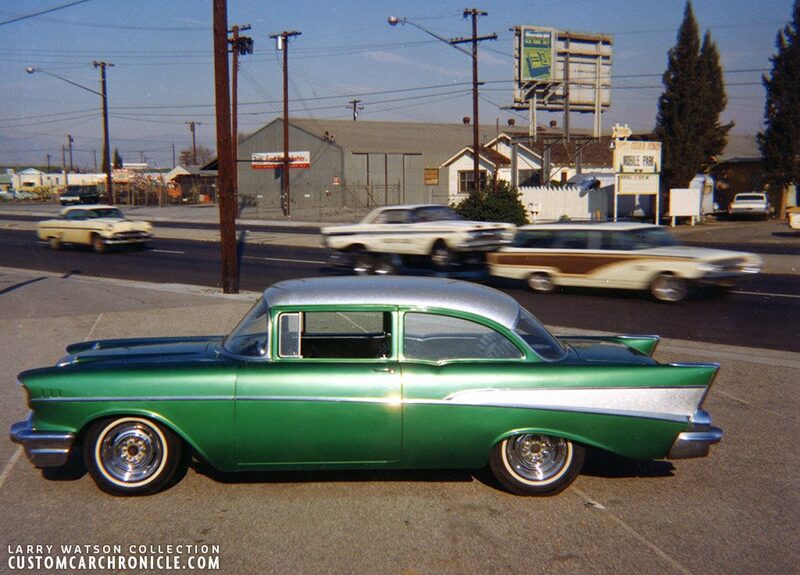 Amazingly the photo was taken at the moment the Chrisman Mercury Comet was passing by in the background. 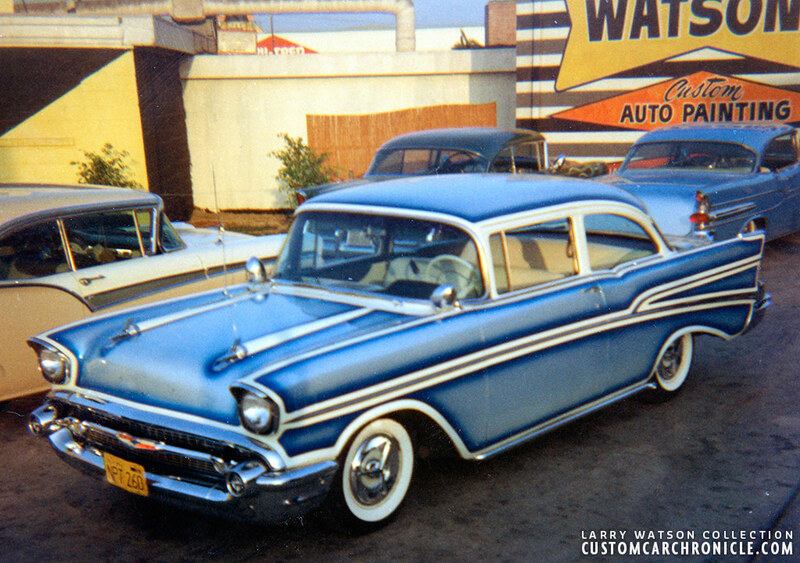 Candy blue and pearl light blue on the top in the mid 1960’s. Typical mid 1960’s paint job from Larry Watson. 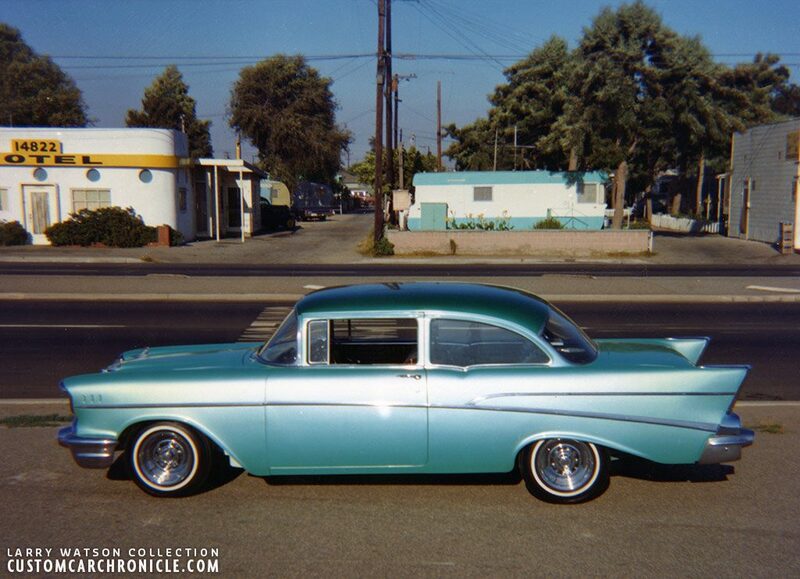 Simple two tone on this mostly stock 1957 Chevy. Larry painted the car in a brilliant candy orange with a metallic warm gold on the top. 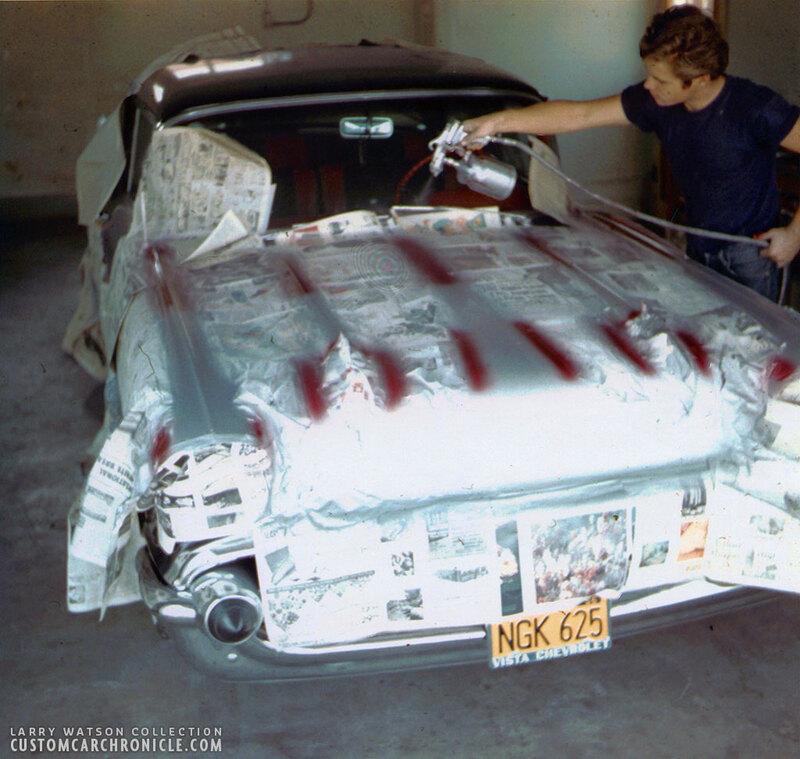 By this time Larry had found out he could make much more money when he did more simple paint jobs, instead of the wild panel, fade, flame and special effects paint jobs he did in the late 1950’s and early 1960’s. 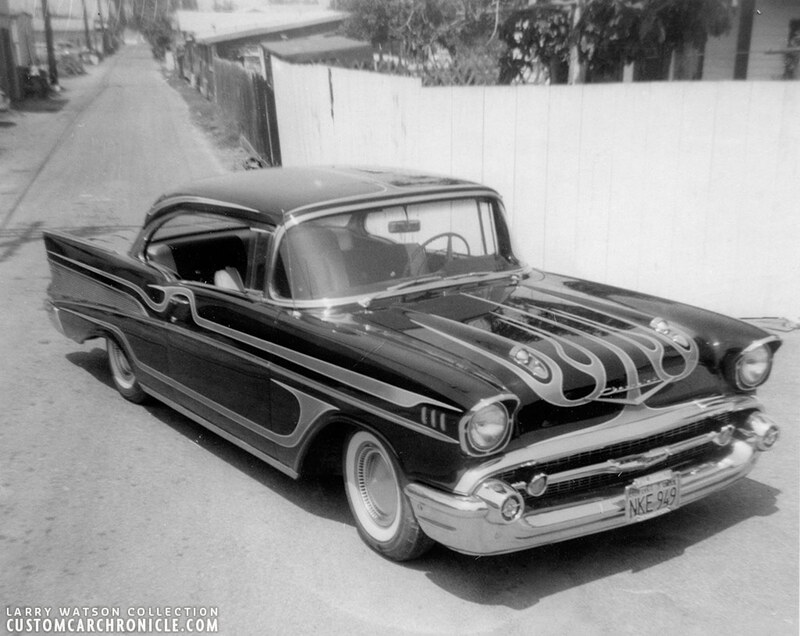 Even though the outside of the unidentified 1957 Chevy is stock it looks like it has a pretty wild all custom interior. 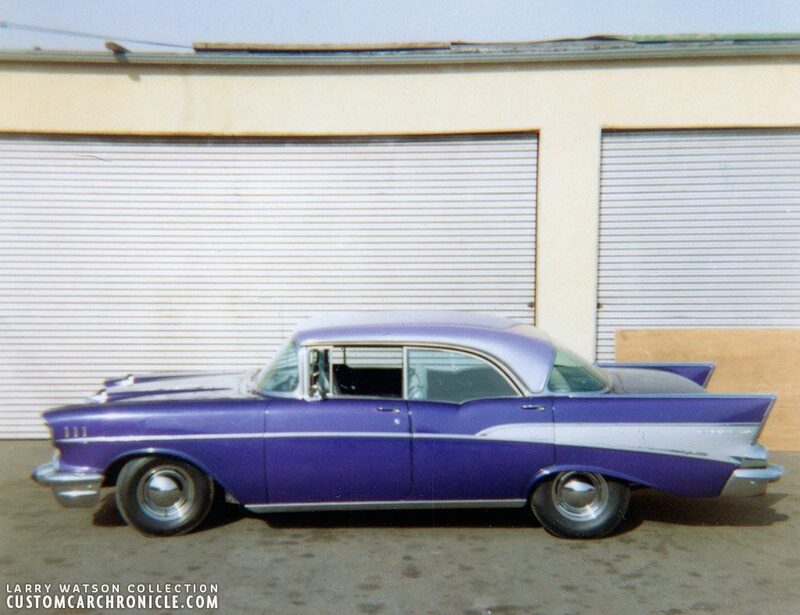 This great looking lavender pearl and Candy grape 1957 Chevy painted by Larry is yet another proof that these cars look so good as mild Custom Car. And it makes me wonder why we don’t see them more done like this today. Larry even painted a ’57 Chevy four door. Purple and lavender. Very nicely done 1957 Chevy Nomad. 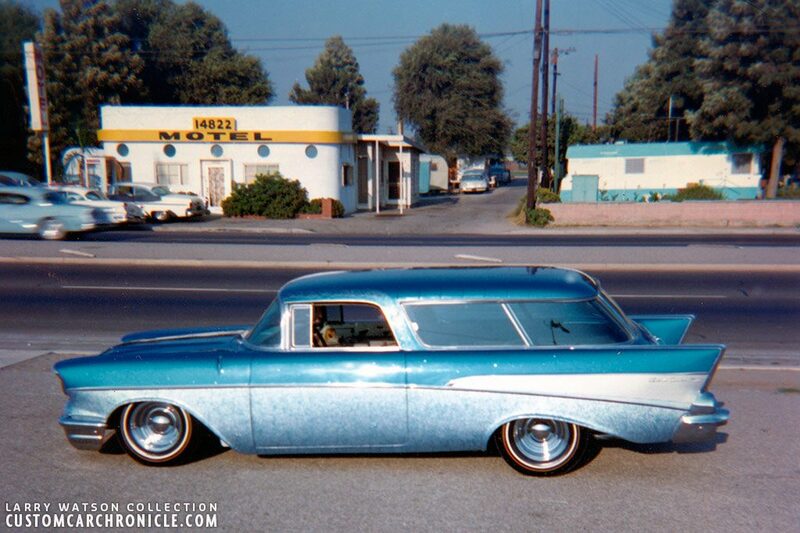 Larry painted the smoothed Nomad in a metal-flake medium blue with some veiling in silver around the B-pillar and above the doors. And blue cow-webbing on the silver panel below the side trim. And most likely hydraulics on the front. This close up photo gives a better look at the paint Larry used, the blue cob webbing on the lower panel and the silver veiling gun effects on the roof and B-pillar. Notice the molded in sunken antenna on the front fender and the white and yellow striped tires. Anybody knows who’s car this was? Bright red with silver rood inserts on this Nomad with Hydraulic suspension was photographed at Larry’s Firestone Blvd. shop in Downey. 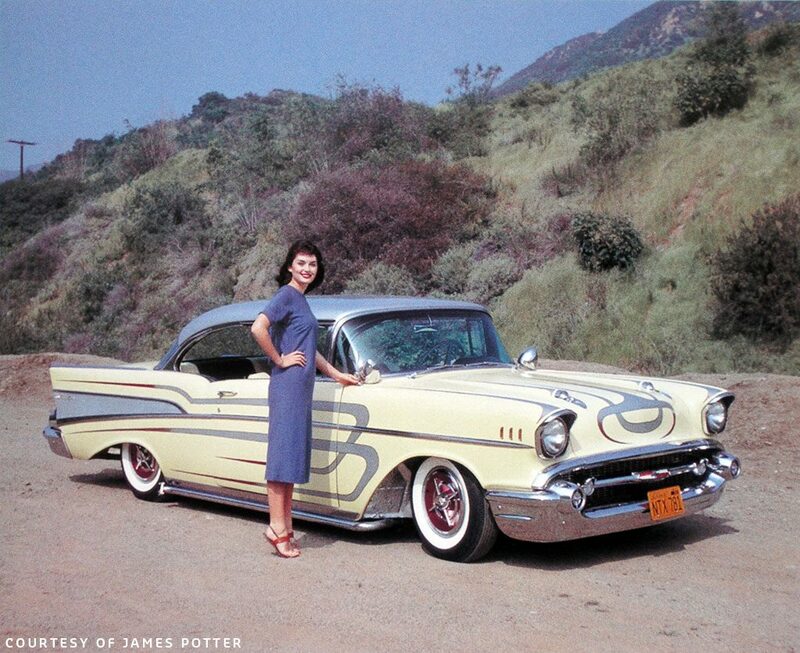 It was the last photo photo I could find in his collection showing a Watson painted ’57 Chevy. 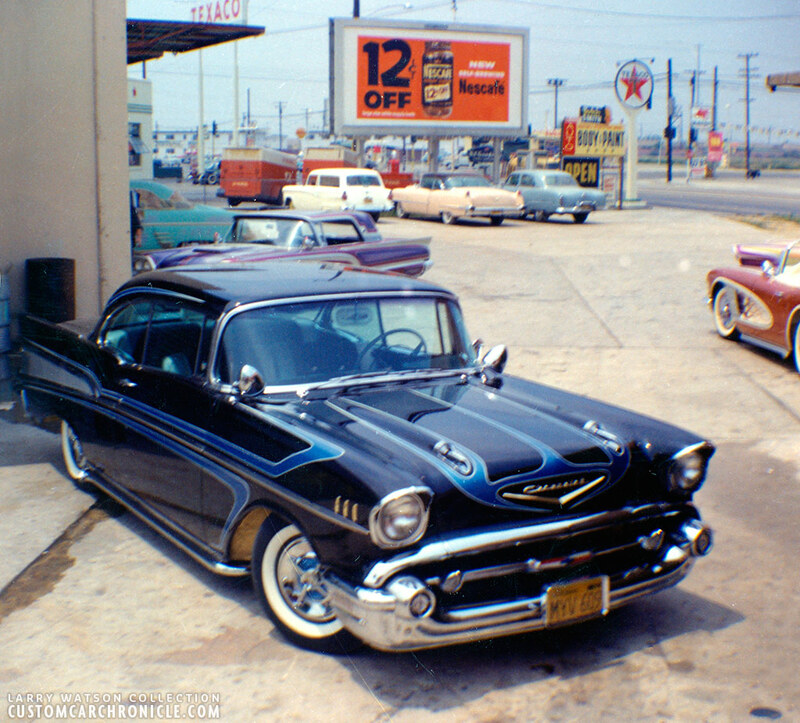 A nice collection of photos of ’57 Chevs with Watson scallops and paint jobs. 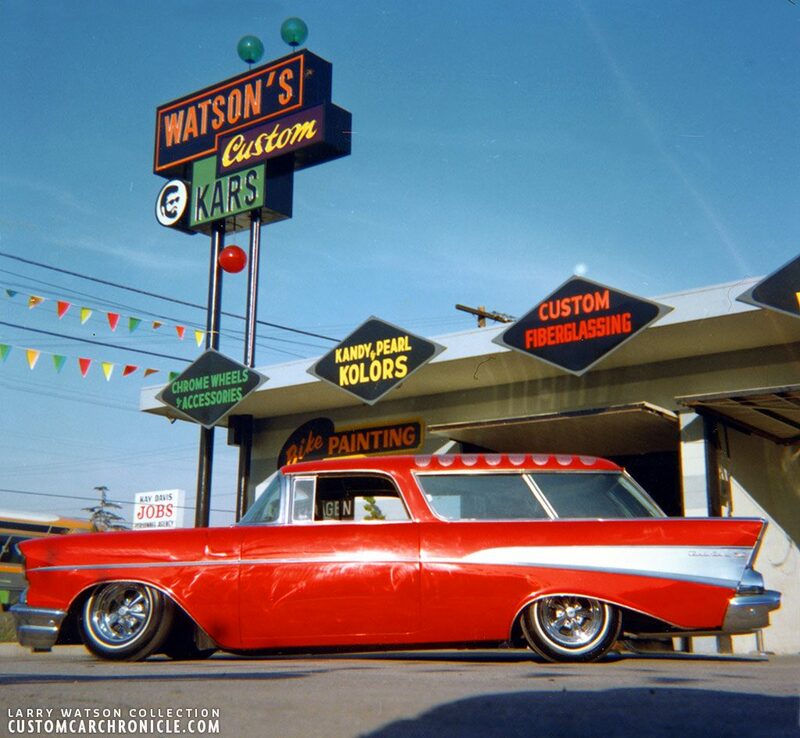 I always felt that the ’57 Chevs didn’t need more than a few modifications to make them look great and these Watson painted cars really look so good to me. I agree with Tom. These cars really lent themselves well to Mr Watson’s style of painting. Just a stance adjustment, and a change of wheel covers did wonders. I don’t even mind the look of the lake pipes on these. Even in the mid 70’s that car was still the bee’s knee’s. Gone now, but not forgotten…….